Often when hire a social media agency or consultant to work on your Facebook page they or when you need to assign a colleague tasks on your company’s Facebook page, it’s usually necessary for them to be granted admin rights. 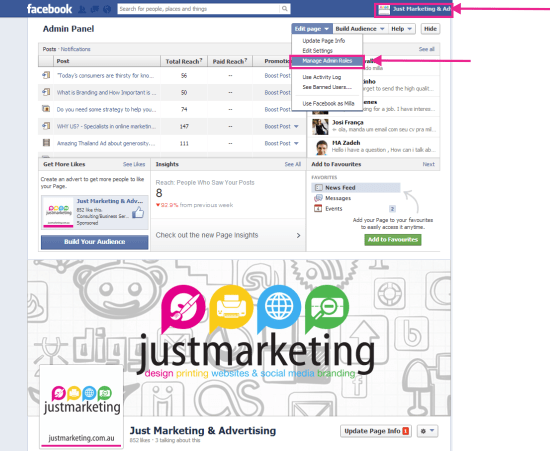 You can easily add your Facebook friends as an admin of your fan page, but if you’re not Facebook friends, you can add people via their email address. Note: They must have this email address registered (associated) with their Facebook profile. Sometimes individuals use their personal accounts to log into Facebook, and not everyone hooks up their work email address to their Facebook account, so verify with them which email address they want you to use. – and then click Save. OR, if you are Facebook friends with the individual you’d like to add as an admin, enter their name and select their Facebook profile in the dropdown menu that appears. – save and confirm with your password. That’s it! 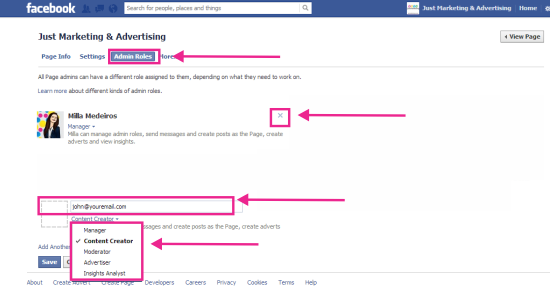 Now your colleague/consultant/spouse/friend is an admin of your Facebook fan page.